Medi-First Flexible Fingertip Bandages 40 Count. Fight back against those pesky paper cuts. These heavy weight, latex free bandages fit perfectly on you fingertips. Each box contains 40 fingertip bandages. 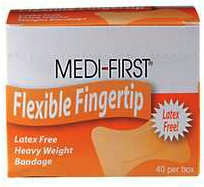 Medi-First Flexible Fingertip bandages - 40 Count. Each heavy weight bandage is latex free.